Decap Attack (also styled DEcapAttack) is a 1991 platforming game for the Sega Mega Drive by VIC Tokai. It is a hack of their 1990 game Magical Hat no Buttobi Turbo! Daibouken replacing everything except the basic gameplay and most of the engine (the sound driver was changed from SMPS to that used by composer Fumito Tamayama's company Graphic Research). 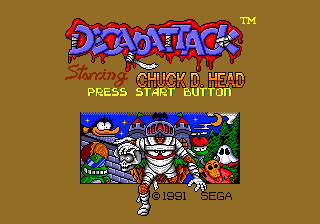 You play as Chuck D. Head, a decapitated mummy who must defeat the forces of the evil Max D.Cap, an underworld warlord who is invading the world of the living. Basic gameplay is similar to that of Magical Hat. There are many changes such as inclusion of heart life bar, which allows you to take few hits before death, tweaks and changes to level design, removal of one of bonus games and score system, changes to enemy and boss behavior. Sonic the Comic included "Decap Attack" comics strips. The first story arc was an adaptation of the game's plot, while later stories took their own spin. Story arcs are: "Decap Attack starring Chuck D. Head" (issue #10 to #15) and "Who Killed Chuck!" (#34 to #39). Writers continued to make "Decap Attack" comic strips due to popularity, often creating single-part stories, with very few small 2-3 part story arcs. All of them still had a single continuation. Not counting the first two big story arcs, there were 29 more separate stories (issues #40, #66 to #68, #69, #70, #71, #89, #90, #91 to #93, #94, #97 to #99, #101, #102, #104, #105, #107 to #108, #109, #110, #111, #113, #114 to #115, #116, #119, #120, #123, #125, #126, #129, #130, #131 to #132). It was the last non-Sonic comics strips in Sonic the Comic, for long time being the only one in the latter half of the 1990s before being cancelled as well. Main article: Decap Attack/Magazine articles.